Thursday night saw the MLS All-Stars do battle against Arsenal in San Jose, but it’s straight back to divisional action on Friday night when Eastern Conference leaders New York City play host to Colorado Rapids, who sit second in the West. Baldomero Toledo, who made his debut refereeing the Rapids in 2004, takes charge at Yankee Stadium to kick off week 21. Then it’s on to an action-packed Saturday, with a further nine games taking place. First up, it’s the US Open Cup champions against MLS Cup champions! Ricardo Salazar – an All-Star referee in 2009 – is at Children’s Mercy Park where Sporting Kansas City take on Portland Timbers. Drew Fischer is in the center for Seattle Sounders versus LA Galaxy with Corey Parker – the reigning MLS AR of the Year – in support, along with Apolinar Mariscal and fourth official Jose Carlos Rivero. Sitting at the summit of the Western Conference is FC Dallas, and they host Vancouver Whitecaps in a 6pm ET kick-off. Whitecaps faced another Texan outfit, Houston Dynamo, in week 20 – a game which was the feature of PRO’s latest Play of the Week. D.C. United and Montreal Impact meet at RFK Stadium, where AR Ian Anderson will move to 15 assignments on the season, a league high. The 2011 AR of the Year, Corey Rockwell, carries the other flag in a game officiated by last year’s US Open Cup ref, Ted Unkel. Chris Penso was the man in the middle for Thursday’s All-Star game, and he’s fourth official this weekend in support of Fotis Bazakos. Brian Poeschel and Logan Brown complete the crew for Chicago Fire versus New York Red Bulls. 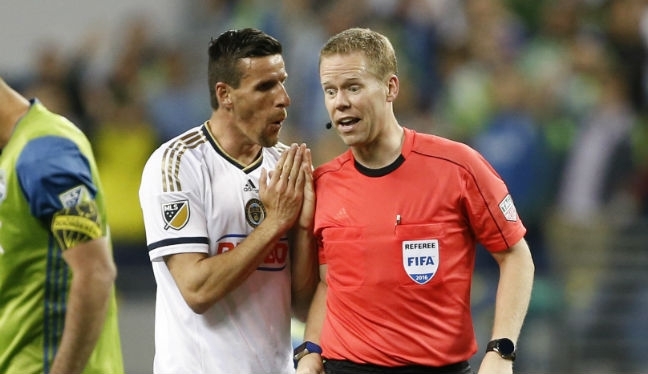 Juan Guzman was fourth official at Avaya Stadium on Thursday and returns to the middle to oversee Philadelphia Union versus Real Salt Lake at 7pm ET. Allen Chapman and Silviu Petrescu are both on duty too, at Toronto FC and Orlando City respectively, before Alan Kelly brings week 21 to a close. The current MLS Referee of the Year takes the whistle for Houston Dynamo versus San Jose Earthquakes, which will bring the Irishman level alongside Ismail Elfath at the top of the assignment charts – both men having refereed 13 games apiece.